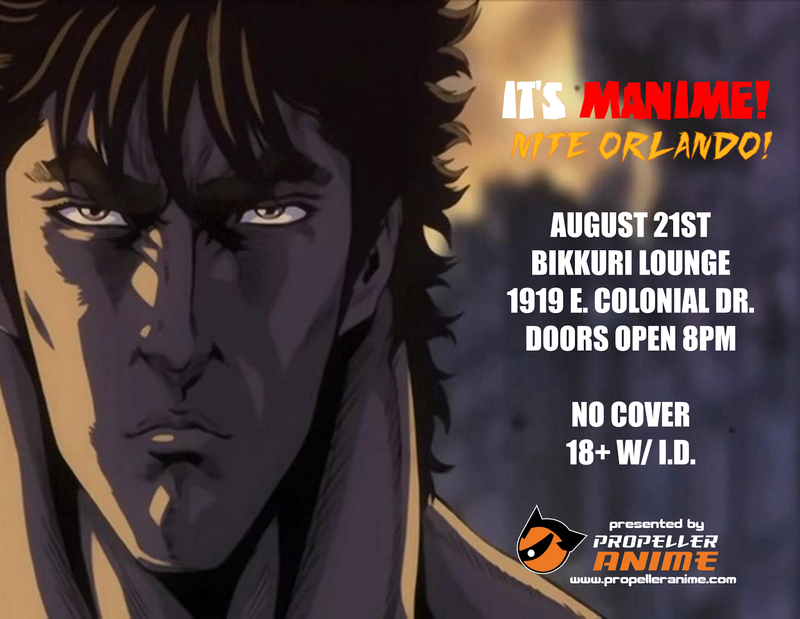 Thursday, August 21st at Bikkuri Lounge! (1919 E. Colonial Dr.) Doors open at 8pm! No Cover! 18+ with valid ID! It's a celebration of violence, justice, headbutts, manly tears, exploding bodies, and beef jerky! (Actually, outside food and drink are not allowed.) This ELECTRIFYING night is guaranteed to put some hair on your chest! 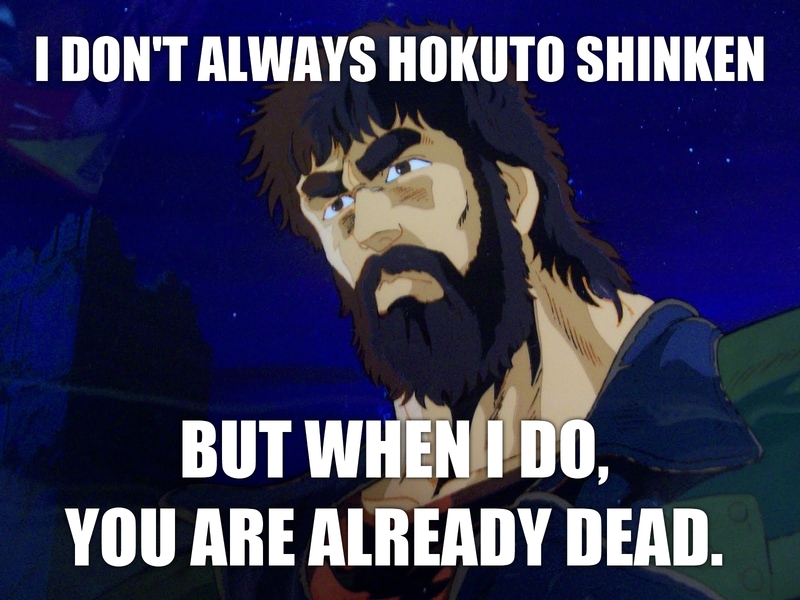 Our main feature of the night will be the manliest anime of them all, Fist of the North Star! In the not-too-distant future of 199X, nuclear war has ravaged the earth and the world has fallen to chaos. 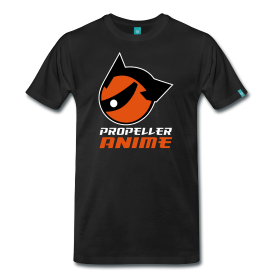 The strong rule the weak with powerful martial arts and only one man can stop them: Kenshiro! Kenshiro posesses a secret fighting technique called Hokuto Shinken that makes enemies explode into a violent mess when he strikes their pressure points! It's amazing. On his quest to find his beloved fiance Yuria, he fights gangs, madmen, former friends, and even his own brothers! It's an epic if there ever was one. The Greatest Tournament Arc In All Of Anime! 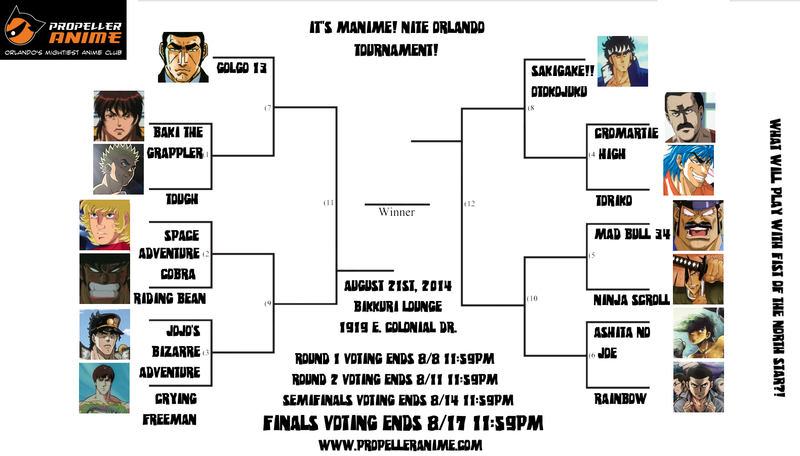 We will have a tournament to determine with manly anime gets shown with Fist of the North Star! Four rounds! Round 1 ends 8/8 at 11:59pm! Round 2 ends 8/11 at 11:59pm! Our Semi-Finals ends 8/14 at 11:59pm! And then our finals ends 8/17 at 11:59pm. 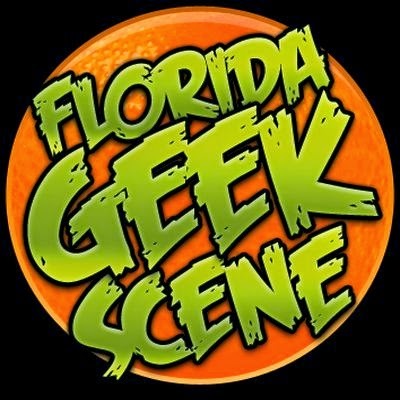 Vote for the Finals NOW! P.S. Listen to our latest podcast. The second half is the exact opposite of this night, but it's still awesome!